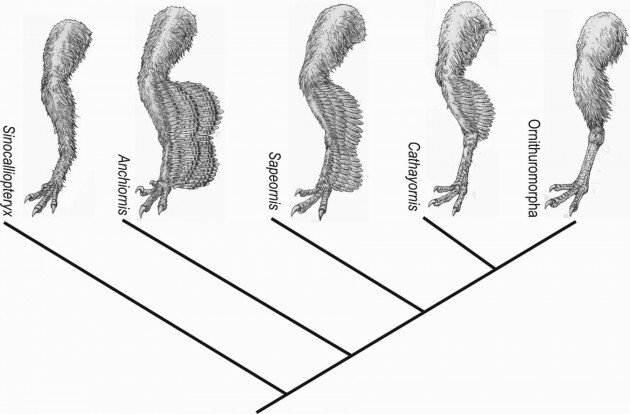 Birds may have evolved from an ancestor with four wings. Either way, there are numerous insights that this as yet unresolved observation contributes to our thinking about bird evolution, and evolution in general. For example,this may be a case of non-linear evolution. When we look at living species (A and B) that we know shared a common ancestor resembling one of them (A), we can guess that the features seen in A evolved in steps more or less linearly to eventually resemble the corresponding features seen in B. For example, we think that chimpanzees and humans shared a common ancestor that resembled chimps a lot more than humans, and in fact, we consider living chimps to be a pretty close analog to this common ancestor. Chimp teeth are somewhat larger in relation to body size than human teeth, and human teeth have somewhat thicker enamel than chimp teeth. This might suggest that chimp-like teeth transformed over time, step by step, in a linear fashion, to become human-like … slightly smaller and somewhat thicker enameled … over evolutionary time. That would be a reasonable hypothesis, but it would be wrong. When we look at the teeth found among fossil remains of human ancestors and their relatives, we clearly see that the creatures that arose form a chimp-like ancestor bore teeth are as different from both chimp and human teeth as one might see anywhere in the fossil record of mammals evolving over a few million years. In human evolution, our ancestors changed, in their dentition, from a chimp like form (we presume) to something entirely different, with teeth being much larger (scaled by body size) and enamel being much thicker (scaled by tooth size), then becoming much smaller again, with enamel getting thinner as well. In human evolution, teeth did a two step from typical ape-sized teeth to mega-teeth to teeth small for an ape. Similarly, it would appear, as birds evolved from a dinosaur that did not fly to what we think of as birds today, they may have first gone to the four winged pattern, then to the two winged pattern, rather than simply having forelimbs that became, in a linear fashion, more and more wing-like. It is sometimes difficult to imagine what intermediate forms would have looked like. This is a standard starting point for many specious creationist arguments that claim that evolution is impossible. How can you get an animal that has half-wings, wings that don’t provide for flight, but that might also be not as good as forelimbs for normal forelimb functions? Paleontologists have suggested that rather than flight, early dinosaur-bird critters would have glided. There are plenty of gliders out there, including mammals, snakes, and lizards, so gliding without powered flight is a thing. Perhaps early birds were gliders, then from this gliding strategy, semi-powered flight emerged, then eventually true powered flight. The idea that birds may have had four wings adds to and somewhat revises this idea. Perhaps it was more likely (“easier” is a term I don’t like but that might apply here) for evolution to come up with something like powered flight using all four limbs (and a tail) in some combination whereby the five appendages provided power, lift, and maneuverability. Indeed, it may be that maneuverability (while gliding) had to precede powered flight, and feathered hind limbs contributed to this important capacity. Once powered flight (with five appendages including the tail) was established, it may have been “easier” (or at least, easier for us to conjecture!) that the role of powering flight could have shifted from being distributed among four limbs assisted by a tail to mainly the forelimbs, with the hind limbs eventually stepping, as it were, out of the picture and becoming what we know of now in birds. The fossil record has a number of examples of two-steps. There are others, besides the teeth, in human evolution, such as shifts from high levels of sexual dimorphism in body size to much higher levels to much lower levels to moderatele levels and back to lowish levels. The evolution of land vertebrates may have gone through a similar sequence with “legs” evolving first as fancy fishy fins for foraging and locomoting in shallow water which became leg-like long before they were ever walked on, “pre-adapting” (another term I don’t like but sometimes fits) early tetrapods for leggy life on land. The evolutionary two step combined with “pre-adaptation” may be a very common scenario for major evolutionary change. The bird lung, which is amazingly well adapted to provide astounding aerobic capacity for aerial acrobatics was probably established much earlier in evolutionary time to provide two legged dinosaurs with terrestrial stamina, for example. Occam’s razor, also known as the principle of parsimony, dictates that given a number of alternative explanations it is best to chose the one with the fewest steps. This is a bad idea in palaeontology, I say this knowing full well that this statement is virtual heresy. Choosing the evolutionary scenario with the fewest steps does serve a purpose. It increases the liklihood that the proposed scenario, the one with the fewest steps, will have the fewest things wrong with it. But it is very often the case that the simplest scenario of change from Species A to Species B is simply too simple. Evolution, and probably similar things like history, is not predictable at finer levels of analysis even if the larger patterns seem to follow expectations more often than not. Given a range of hypotheses with different levels of complexity, quite often they all turn out to be wrong, but the real story is rarely simple. Also, a prediction: In the future, experts studying early birds will question the definition of powered flight vs. stabilization. They will use computer models of flight to show that the two functions are less independent than we previously thought and a given body part can do both at the same time to a greater degree than seen in modern birds. Instead of wings pushing and tails turning, tail-like and wing-like functions will be distributed more evenly across all five feathery fixtures of fore-wing, hind-wing, and trailing tail. A similar scenario: Moas are now thought to have reached proto New Zealand after it broke away from Gondwanaland, thus these huge flightless birds evolved from a flying ancestor. So two legged dinosaurs evolved into flying birds which then lost their ability to fly and ended up looking a bit like two legged dinosaurs.